A gathering of family and friends will be held Thursday, July 21, from 4 p.m. to 7 p.m., at Zion United Methodist Church in Buffalo Lake, and will continue on Friday for one hour prior to the service at the church. Peggy Mae Schulz was born June 19, 1941, in Fairmont, the daughter of Earle and Inez (Spee) Jones. She was baptized as an infant, and confirmed in her faith as a youth. She graduated from Litchfield High School in 1958. On Oct. 3, 1964, she was united in marriage to Nolan Schulz at St. Matthew’s Church of Christ in Forest City. They made their home in Stewart, and shared 51 years of marriage. Mrs. Schulz was a cashier for First Minnesota Bank, working at the bank locations in Stewart, Hutchinson and Glencoe. She retired after working with the bank for 45 years. 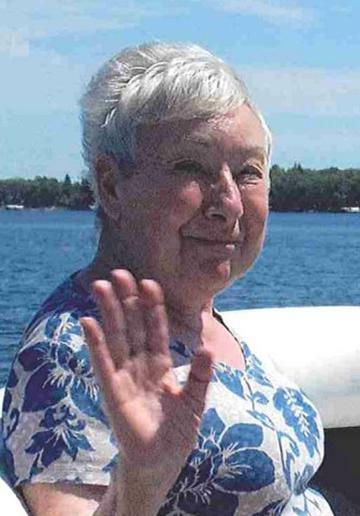 She was a member of Zion United Methodist Church in Buffalo Lake. She enjoyed gardening, reading, knitting and crossword puzzles. She and Nolan liked spending time at the lake. She loved her family, and especially time spent with her grandchildren. She is survived by her husband, Nolan Schulz of Stewart; son and daughter-in-law, Dirk and Lois Schulz of Wadena; grandchildren, Nevada Schulz and Mercedes Schulz of Wadena; sister and brother-in-law, Sandi and Ron Scepaniak of Marietta, Georgia; sister-in-law, Jan Jones of Northfield; Everett and Billie Diepold of Stewart; many other relatives and friends. She was preceded in death by her parents and her brother, Robert Jones.